There are only two ways to travel to the Okinawa Prefecture. You can take various flights or ferries from the mainland Japan. The most common way is flying to one of the major islands such as Okinawa Island, Miyako Island or the Ishagaki Island. Taking a flight to the prefecture isn’t always more expensive than ferries. Nevertheless, flying is much faster of course. There are only a couple airlines that operate daily flights from Tokyo to the capital Naha. These airlines are Japan Airlans (JAL), ANA, Skymark, Vanilla Air and Jetstar Japan, which all fly directly from Tokyo Haneda Airport to Naha Airport. Some budget airlines such as Vanilla Air and Jetstar Japan fly from Narita Airport. The average flight duration from Tokyo to Naha is around 2.5 hours. You can book return flights for an average price of 65.000 Yen, which is around $550 US Dollar. One-way tickets can be bought around 45.000 Yen ($380 US Dollar). The cheapest airlines such as Skymark, Vanilla Air and Jetstar Japan can offer budget one-way tickets between 5.000-25.000 Yen, the return ticket will cost you double. Nevertheless, flying is faster and probably cheaper than taking a boat to Okinawa. Naha Airport is located just outside the city in the South of the Island. From this point it is best to take a rental car since the public transportation is far less developed than on the mainland. Nevertheless, it is possible to use the bus or taxi to move around the island. From Naha Airport on Okinawa Island it is possible to fly to the surround islands within hours. Daily flights leave to the Daito Islands (Kitadaito and Minamidaito), Kerma Islands (Kumejima and Kerama), Miyako Islands (Miyako and Tarama) and Yeayema Islands (Ishigaki, Hateruma and Yonaguni). It is probably faster to take the ferry to the Kerama Islands since they are in close distance of Naha port. There are only a few long distances ferries going from the mainland Japan to Naha Okinawa. One departs from Kagoshima and the other from Osaka. Both these ferries are part of the A line. Are you travelling from Tokyo than you are only able to book one of the special trips of the A line which only departs six times a month. This ferry trip will take up to 44 hours and cost you around 25.000-50.000 Yen, which is almost the same as a flight. When you are on the Japanese Island Kyushu than your best option to travel to one of the Okinawa Islands is by booking a ferry from the city Kagoshima. 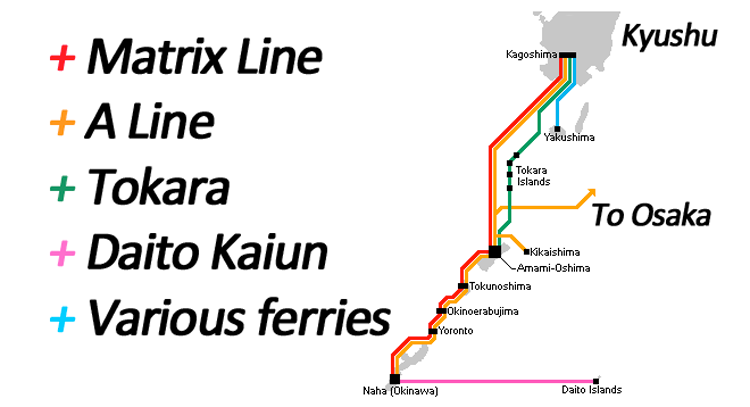 From Kagoshima there are five official ferry lines such as the Matrix Line, A Line and the Tokara. It is also easy to hop from island to island because most ferries will end their journey in Naha but stop on each island on their way. Common ferry stops before Naha are Yakushima, Tokara Islands, Amami-Oshima, Tokunoshima, Okinoerabujima and Yoronto. The prices for ferry tickets are fluxional and depend on the high and low season. Many other ferrylines also operate in these waters but the Japanese government does not officially recognize them.